Dr. Gill provides you with the option of braces or clear aligners to straighten the malaligned or crooked teeth and to correct any bite anomalies you might have. After a thorough evaluation of the teeth and the x rays ,the diagnosis and the treatment options are discussed with the patient and the orthodontic treatment is provided using the most suitable system between the- Clear aligners e.g clear correct, invisalign. Want straight teeth without cumbersome braces. Then clear aligners might be the right option for you. Clear aligners are made of thermoplastic materials using unique CAD –computer aided design and CAM-computer aided manufacturing technology. They are removable, comfortable and almost invisible to the extent that no one can tell you're wearing one. So you can laugh, smile and eat normally during the course of the treatment. Each tray is worn for about two to three weeks before being replaced by the next set of trays, until you achieve that wonderful smile with straight teeth. The only drawback with this system is that patient compliance is of utmost importance otherwise little to no progress will be made. Dr. Gill is a certified clear aligner provider. Also called fixed orthodontic therapy as this method uses fixed or bonded brackets. There are many different types of braces or brackets used in orthodontics to straighten teeth. 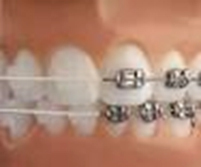 Common types of braces are silver and clear braces. In general, every bracket functions as an attachment site for the orthodontic wire, which provides the dynamic force on each tooth to cause movement. The advantage of conventional braces over clear aligners is that more complex cases can be treated with braces and patient compliance is not a detrimental factor as the brackets are bonded to the teeth and cannot be taken off by the patient. Dr. Gill is a USDI trained dentist for fixed orthodontic therapy.